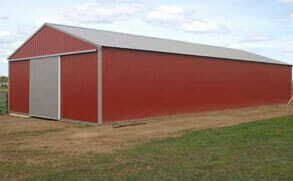 Premium materials and quality construction guaranteed to protect your vehicles, livestock, equipment, and more! Our Buildings Aren't Just Designed to Last, They're Designed to Look Amazing. With the wide variety custom colors, styles, and sizes available - we're sure to have what you're looking for. From choosing the perfect building, to its delivery and construction, Eastern Buildings, LLC is known for offering a friendly, convenient, and hassle-free experience from start to finish. 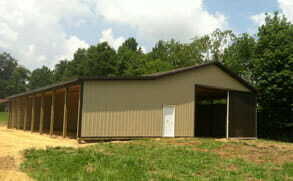 Whether you need additional storage for tools and equipment, a new garage, or a home for your horses and livestock, we have all the services you need - from professional design to free delivery and expert construction for post-frame structures. We use only the highest quality materials and our experienced team of licensed builders will ensure that your new barn or garage is built to last. From Design to Completion - You Can Have Your Building in as Little as Four to Six Weeks! 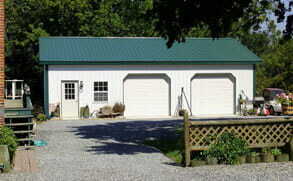 - We offer free price estimates on the first call. 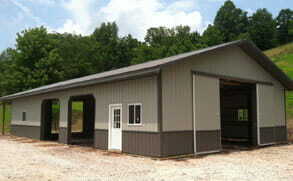 Our Buildings Are Available in a Huge Variety a Customizable Color Combinations! With 16 different color options that can be combined in any number of ways, the possibilities are endless! To learn more about what colors are available, or to experiment with choosing your perfect color combination, try out our interactive color visualizer tool today. Just wanted to tell you again what an awesome crew you have. Our new building has really stirred interest with passers-by, as well as neighbors. It is a beautiful building! Tammy L.